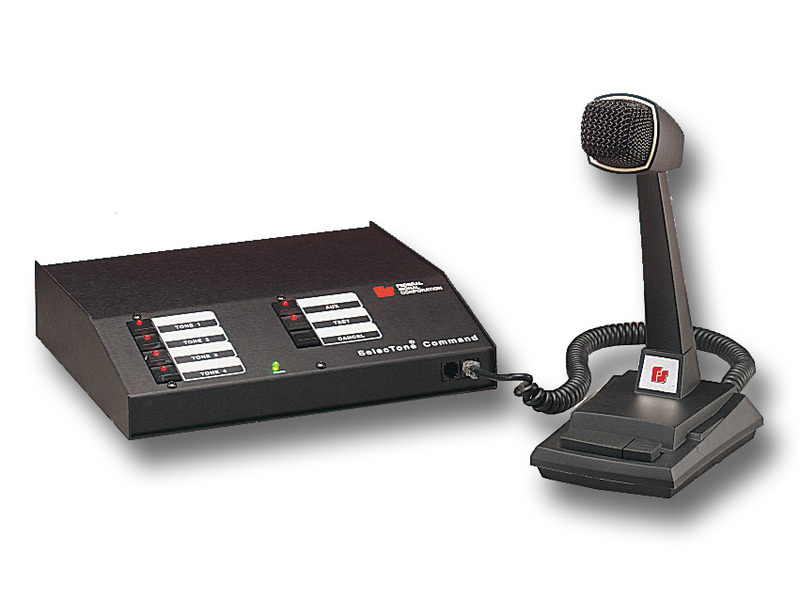 The Federal Signal Model 300VSC-1 SelecTone® Command Unit generates up to four tones or voice communications in a SelecTone System. Four tones, auxiliary, test and cancel are controlled via an illuminated keypad. Voice transmission is activated by keying the optional desktop or hand-held microphone. Public address can be accessed from the local microphone or via the remote microphone input. Audio input allows background music to be played from any 1 volt-peak-to-peak source system. Public address has the highest priority followed by tones 1-4, remote microphone and auxiliary audio. External switches can be wired into the command unit for automatic remote operation of the signal system. The 300VSC-1 SelecTone Command Unit is the basis for a simple, versatile general signaling system for weather warning, start and dismissal, general alarm, evacuation and paging.